April 22, 2019 (El Cajon) - Near the northwest corner of Gillespie Field is an annex of the San Diego Aerospace Museum, where visitors can hear lore and legends about aircraft from people who, in some cases, made them originally or who are helping to estore them to museum quality. October 9, 2018 (El Cajon) – Aboard an exhilarating flight on a World War II B-17G warbird named the Sentimental Journey, WWII veterans told spellbinding stories about their experiences as combat pilots and prisoners of war. This peace-time flight out of El Cajon’s Gillespie Field was offered on October 1st to members of the press and public, thanks to the Arizona Memorial Museum’s staff and flight crew. April 1, 2018 (El Cajon) – At the Warbird Expo hosted by the Commemorative Air Force at Gillespie Field in El Cajon (north ramp of Marshall Ave.) on Saturday, April 14th, warbirds, classic aircraft, classic cars and WWII memorabilia will all be part of a fun-filled day for the whole family. Gates open at 9 a.m. and the event runs until 4 p.m.
January 21, 2018 (El Cajon) -- We hope your year is off to a happy and healthy start. However, for those of us concerned about heavy local traffic, safety, noise, toxic air and lead overhead, with protections for homeowners few and far between, the new year is already daunting. FAA approval for an increase in air traffic... a state of the art flight training center... the lengthening of the 27L training runway...the redesign and enlargement of the Bradley Street interchange off hwy 67... and the development of 9 five acre parcels of land for aviation usage called the Cajon Air Center are all coming together step by step over the next several years to form the perfect storm. May 22, 2017 (El Cajon) -- Organizers of the biggest annual air show in East County say they cannot afford to put it on because of rising costs and an inability to raise sufficient funds. March 25, 2017 (El Cajon) – Cal Fire and Heartland Fire crews responded to a call at 6:30 this morning in the 1500 block of North Magnolia Ave. in unincorporated El Cajon, where they found an auto repair shop fully engulfed in flames. February 14, 2017 (Ramona) – A Cessna registered to the American Aviation Academy and flying out of Gillespie Field as an instructor/student flight on Sunday crashed onto a mountainside in Ramona, killing Shaira Noor, 21, of Bangladesh. She had been training at the academy for nine months. Noor was in the backseat of the Cessna and was impaled by a tree on impact, which killed her instantly. Two other occupants survived, climbing to an elevated area and using cell phones to call for help, the Sheriff’s department reports. February 4, 2017 (El Cajon) -- While many residents near El Cajon’s Gillespie Field decry an increase in activity from flight schools, proponents of a long-planned airport expansion say the project could generate thousands of high-paying, high tech jobs, and be a boon to East County. January 20, 2017 (San Diego’s East County) -- El Cajon’s Gillespie Field is in the middle of an expansion aimed at creating more hangers, more space for aviation- related businesses, and thousands of new jobs. November 2, 2016 (El Cajon)--County officials and community members broke ground on Gillespie Field Airport’s new Cajon Air Center on October 31st. The groundbreaking kicked off the first phase of a multi-phase redevelopment project in unincorporated El Cajon. August 9, 2016 (El Cajon) — The Federal Aviation Administration has approved a request from Gillespie Field Airport Manager Marc Baskel to permanently raise the minimum altitude for air traffic over Gillespie Field from 1,188 feet to 1,388 feet. July 20, 2016 (Gillespie Field) - Join the Santee Chamber of Commerce at their first-ever Black Tie Car Show Gala on Saturday, August 20th from 5 p.m. to 10 p.m. at High Performance Aircraft at Gillespie Field. April 24, 2016 (El Cajon) - A number of residents recently attended a community coffee for State Senator Joel Anderson. It was hosted by El Cajon Mayor Bill Wells on Thursday, April 14th, 2016. January 28, 2016 (El Cajon)--A plan to expand operations at Gillespie Field and develop a 70-acre site once occupied by the El Cajon Speedway was put in a holding pattern because of a lack of federal funding. Earlier this month, board members from the Gillespie Field Development Council, a five-member board that oversees the county-owned airport, heard that expected federal grant funding to finance the estimated $30 million project wasn’t available. 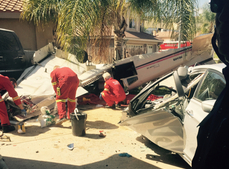 September 21, 2015 (San Diego’s East County) --After a plane crashed into a Santee home on September 3rd, killing the pilot and a flight student near Gillespie Field, Advocates for Safe Airport Policies or “ASAP” is calling for action to protect community members. ASAP has made many complaints to officials before this crash, which is the latest in a string of crashes and serious mishaps involving planes at Gillespie. But recently residents have warned of frequent and low flights over homes due to an increase in flight school training of students at Gillespie Field. Now ASAP is holding a meeting for concerned airport neighbors. The event will be held September 30th at a private home in Fletcher Hills. To RSVP and get the addresss contact suestrom1@cox.net. The plane, a Piper PA-28 Cherokee, is currently registered to the Volar Corp. flight school at Gillespie Field in El Cajon, according to Federal Aviation Administration (FAA) records. 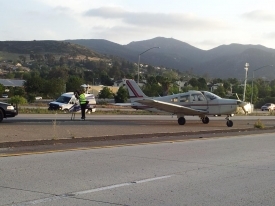 The same plane made an emergency landing on State Route 52 in 2013 directly in front of ECM reporter Paul Kruze (photo, right), 10 News reports. Back then the plane was registered to Golden State Flying Club, another local flight school. June 15, 2015 (El Cajon)—Dozens of families are close to filing a lawsuit over the increased air traffic at Gillespie Field airport, where more expansion is planned. But with a June 30th deadline to finalize paperwork with a class action lawyer, another two dozen residents are needed to join the suit by the deadline. A meeting is set for Tuesday, June 23rd at 6:30 p.m. with the lead attorney and interested residents. The meeting will be held at a private residence in Fletcher Hills. To RSVP and get the address and directions, contact info@asapgillespiefield.com. “This is our last chance to get something done,” says Sue Strom with Advocates for Safe Airport Policies ASAP. June 17, 2015 (San Diego’s East County) – Air Show San Diego will take to the skies over Gillespie Field in San Diego June 20 and 21. This year’s “AirShow San Diego” (formerly known as “Wings Over Gillespie”) will feature a representative collection of aircraft and acts to support the commemoration of the 70th anniversary of the end of WWII. May 27, 2015 (El Cajon) – Parents have filed a class action lawsuit against Ametek Aerospace & Defense in El Cajon, alleging that the company dumped toxic waste into the ground for 20 years, from 1963 to the 1980s. The site is located next door to Magnolia Elementary School, where children have been suffering mysterious health problems. View a presentation on the Gillespie Field Sports Village concept by clicking here. Tune in Friday to our radio show at 5 p.m. on KNSJ 89.1 FM to hear our interview with Robert Germann, proponent of the Gillespie Field Sports Village. February 26, 2015 (San Diego’s East County) – Imagine a new Chargers stadium and sports entertainment complex next to Gillespie Field on vacant land formerly occupied by the El Cajon Speedway. Sounds far-fetched? The 250-acre site is surrounded by four major freeways and a trolley stop close by. Approximately 180 acres are currently vacant—and none of this land has been used for aviation. Chargers fans’ future is in limbo, with the team threatening to move to Los Angeles County and share a stadium with the Raiders. The team wants a new stadium, but thus far San Diego county and city leaders have not come up with a solid plan for an alternative location and environmental contamination prevents rebuilding on the existing Qualcomm stadium site. November 22,2014 (El Cajon) – Warbirds West Air Museum invites you to bring a new, unwrapped toy and attend a pancake breakfast and open house on Saturday, December 13 from 8 a.m. to 11 a.m.
You can view World War II aircraft and displays, see over 40 antique and classic cars, and meet Santa Claus. Families are welcome to attend. The museum is located at 1725 North Marshall Avenue in El Cajon at Gillespie Field. June 25, 2014 (San Diego)--The San Diego County Board of Supervisors renewed the Gillespie Field Development Council, despite serious concerns raised by several members of the public. The council runs the day to day activities at the Gillespie Field airport for both El Cajon, which appoints two members, and the County, which appoints three. Robert Germann told the Board that he opposes the agreement since it does not include the City of Santee. He told Supervisors,“Santee should have a seat on the board. I am surprised they are not here demanding one.” The airport has one gate exiting into Santee, built at Santee’s expense. February 1, 2014 (San Diego) – A proposal to require background checks on foreign pilots training at local airports, including Gillespie Field in El Cajon, will be heard by San Diego Supervisors at their Wednesday meeting at 9 a.m. The meeting will be held in the County administration building, 1600 Pacific Coast Highway. Two of the Al Qaeda terrorists who flew planes into buildings in the 9/11 attacks in 2001 had flight training at Montgomery Field in San Diego. January 11, 2014 (El Cajon ) –Two hijackers who flew a plane into the Pentagon during the 911 attacks in 2011 got flight training at Montgomery Field in San Diego. Yet to this day, no background checks are required for foreign flight students taking training locally - including a growing number of foreign flight students at Gillespie Field in El Cajon. Supervisor Dianne Jacob aims to change that with an ordinance that would require background checks. Her measure will be heard by Supervisors on February 5th. January 5, 2013 (El Cajon) – The San Diego East County Chamber of Commerce will hold its annual dinner on Saturday, January 25 at the Allen Airways Flying Museum at Gillespie Field, 2020 North Johnson in El Cajon. 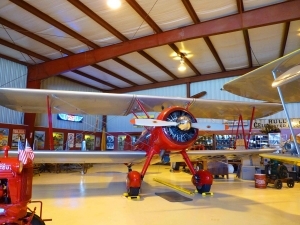 The museum is a private facility open by invitation only, housing an impressive collection of vintage airplanes and memorabilia including an aviation poster collection displayed at the Smithsonian. Cost is $125 per ticket. For more information or reservations, visit www.eastcountychamber.org. November 19, 2013 (El Cajon ) – An investigative report by an NBC TV station in the Bay area adds fuel to concerns raised by East County residents over the safety of foreign pilot training at Gillespie Field. The NBC investigation, titled “Foreign Airline Pilots, U.S. Flight Schools: Do they get enought raining time in cockpit?” has prompted the Federal Aviation Administration (FAA) to announce tighter regulations of training of foreign pilots at American flight schools. In the U.S., pilots train for years in either the military of general aviation, or both, to gain at least 1,500 hours of flight time before being allowed into the cockpit of a commercial jetliner. But the FAA gave out 4,820 license to foreign pilots last year alone – pilots who came here from Asia or other places to train, many with zero flight experience. March 3, 2013 (El Cajon) – Congresswoman Susan Davis called representatives from the Federal Aviation Administration to her Washington office to share constituent concerns with Gillespie Field flight paths. Neighbors of Gillespie Field in El Cajon have complained of increased flight traffic, noise, and low-altitude flights. “As discussion of Gillespie Field development continues, Congresswoman Davis is looking to balance economic expansion in El Cajon and East County with quality of life near the airport,” said Aaron Hunter, spokesperson for the Congresswoman. The meeting was informational, though no course of action has yet transpired, he advised.